They actually arrived on Friday but since the finisher sent them insured they needed to be signed for so I picked them up Monday morning at the Post Office. 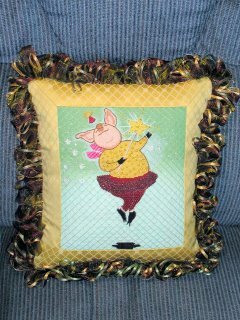 Twinkle pig is done with things I found at Hobby Lobby... isn't the trim fun?? I found the fabric first and loved it because it had the same diagonal pattern I had in the background and at the same time brought out the yellow in her shirt. Now comes the dilemma of where to put her that Indiana won't think its something to burrow in. I had it on the couch last night and he was up there trying to make a hole to nap in, EEKK!! Coronation was done very simple. 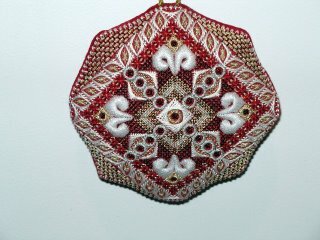 Its much bigger than I expected it to be for an ornament so I had it finished like the photo on the pattern with no trim, just a loop to hang it from the tree. Finished size came out 5" x 5". The back is red ultra suede, a favorite for trimming the back of ornaments for us. 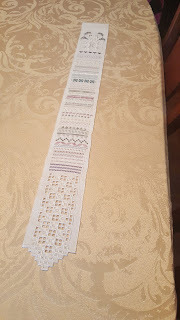 It is rather pricey but I can buy a 1/4 yard and use it for several ornaments so it doesn't work out to be too bad and I like the look and durability vs regular fabric. And at long last... Gloves and Kisses in its bag. 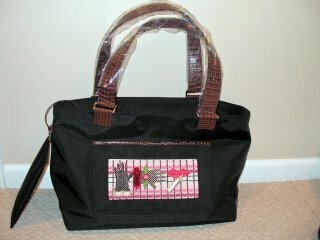 This was a preassembled bag I got from Lee Needlearts. I love Lee bags, the red purse as well as the black clutch and jewelry case are from Lee as well. I picked this one as Gloves and Kisses with all its raised elements just didn't seem like it would make a good every day purse so this will be an over night or stitching bag. Aside of the time it took the shop to get around to inserting the canvas I'm a bit bitter over the price they charged me. I paid less to have Twinkle Pig completely made into a pillow than I did for this. I will most definitely try to do the Red Hat Lady myself if at all possible. 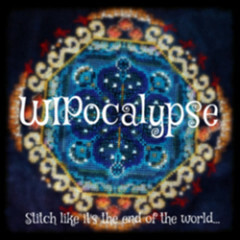 All your finished pieces are gorgeous - congratulations! Thanks for your comment on my blog I'm on West Side also right on the shores of the Lake. Coming to your blog is always such a treat for me. 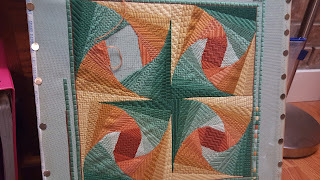 I can't believe how many beautiful projects you work on and finish. Wow! All of your finishes are just lovely! I love ALL of your pieces. The pillow is just too cute. 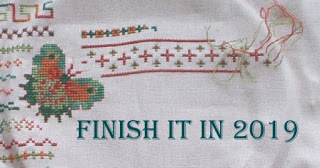 It's nice to see needlepoint on a blog, do everything, needlepoint, cross stitch, punchneedle and crewel. 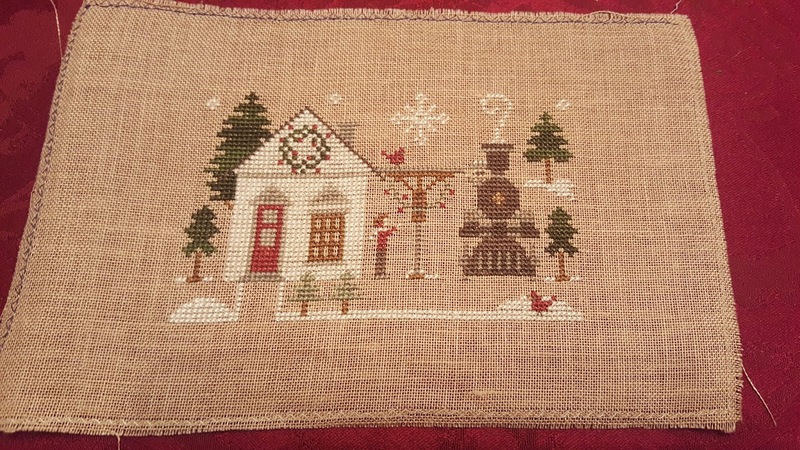 I've been bitten by the cross stitch bug in a fierce way lately though. Haven't needlepointed anything in a while. Great finishing jobs, all of them, but especially that gorgeous ornament, which I totally covet! I'm just catching up on your blog after a bit of a break - I'm loving your Red Hat lady, too. 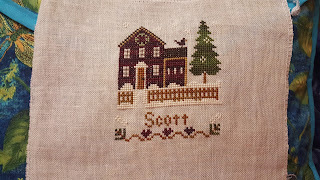 Don't think I'll ever take up needlepoint, but it's nice to view the process and see your beautiful finished things. I like Twinkle pig, she's so cute! Puts a smile to my face instantly!